It is now called Hurricane Ernesto as it passes Haiti and heads toward Cuba. The current forecasted track shows Ernesto striking west-central Florida in four days. But, a lot can change in 4 days with a hurricane's path. 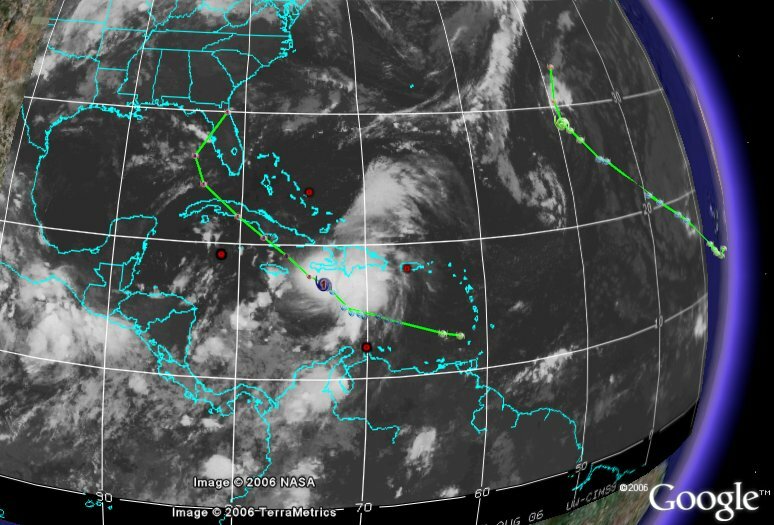 You can track the position of Hurricane Ernesto in Google Earth by using this excellent storm tracker . It shows current storms worldwide, the track of each storm, it's forecasted path, satellite photos, radar, and even shows web cams at towns near the path of the storm. This tool was developed by 'glooton' and posted at the Google Earth Community. There is another hurricane tracker (for Atlantic storms) which shows model forecast tracks, satellite photos, and other data. This was done by Paul Seabury and posted at the GEC as well. Also, check out this and other weather tools put together by Google Earth Blog. By the way, there's a category 5 storm called Ioke in the middle of the Pacific right now with winds reaching more than 160 mph (140 knots). Use the first storm tracker above to see its track. Google Earth is becoming more and more sophisticated. When it was first released I wasn't too fond of it.